Nina and Lily are hoping to follow in her Daddy’s footsteps with a BOTB win – Pee Wee Win that is! Here is a little more about Nina and Lilly who will be running at the BOTB in August. Where did you and Lilly qualify? We qualified at the Barrel Royale in Cloverdale Indiana. 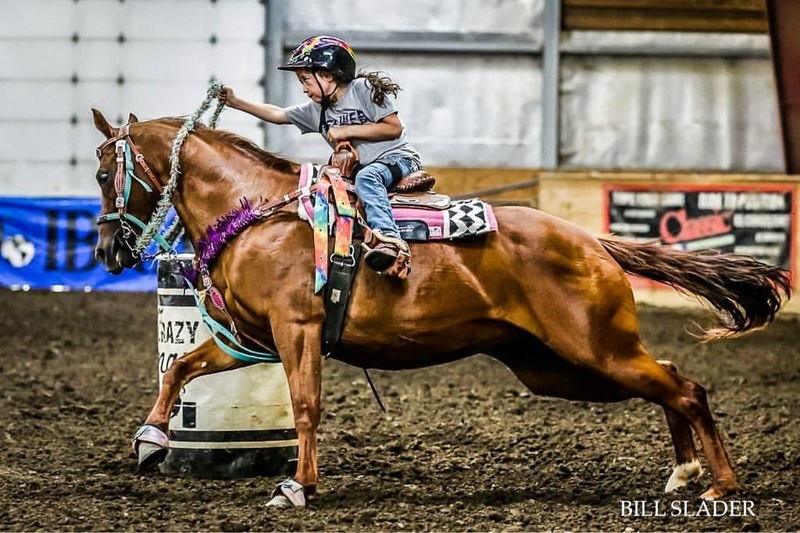 Tell us a little about your horse: Her name is Lilly. She’s 16 years old. She can be a hot tamale but I love her a lot. We have learned a lot together and she has been a lot of fun. I’m very proud of her for qualifying and am so excited to run her in the slot race! Everyone has a favorite place to run, tell us what yours is: My favorite arena would be Springfield. I like the way it is set up and it’s always very exciting. Each year we all love to attend a favorite show, what is yours? Best of the best!!! Give us a little more insight about you and your horse: My dad inspires me and helps me a lot. I love barrel racing with all of my family. Always try your best and love your horse even if you have a bad run sometimes. Previous Rosey Posey in no stranger to the BOTB Pee Wee Race – Kyndra and Rosey will be ready to roll. Next Bella & Leo are looking to make the BOTB 2015 Champ Proud – That is Grandma to Bella!